Honolulu police will be conducting impaired-driver checkpoints over the Super Bowl weekend. Checkpoints are being set up at unannounced times and places through Monday to deter alcohol- and drug-impaired drivers. The Honolulu Police Department, the state Department of Transportation and other county police departments are participating in a nationwide "52/12" sobriety checkpoint program. The program, which began Oct. 1, runs through Sept. 30. House lawmakers honored 16-year-old Tadd Fujikawa yesterday, who became last month the second-youngest player to make a PGA Tour cut, while playing in the Sony Open. 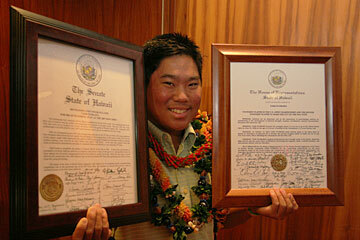 Lawmakers presented the Moanalua High School sophomore with a proclamation recognizing his accomplishment. "Honestly, I really didn't think it would be this big of a deal, but I'm really honored to be able to do this sort of thing," Fujikawa said. "It's really, really fun for me to do this." Fujikawa said he appreciates all of the attention but also looks forward to when things get back to normal. "Hopefully, it can slow down a little bit," he said. "It's kind of hard with school and stuff, but I think I'm handling it pretty well." Moanalua High School student Tadd Fujikawa was presented with a proclamation from the state Legislature yesterday for his accomplishments at the Sony Open. The 16-year-old became the second-youngest person to make the cut at a PGA Tour event. The state Senate confirmed Maui private attorney Keith Tanaka yesterday as a Maui District Court judge. Tanaka's appointment by Chief Justice Ronald Moon had been questioned by Sen. Clayton Hee, Judiciary Committee chairman, who said Tanaka had not disclosed a critical Intermediate Court of Appeals ruling against him. On the Senate floor yesterday, Hee said he was satisfied that Tanaka had acknowledged he would have been more forthcoming if he had it to do over. Hee and the other senators voted unanimously to confirm him to the 10-year term. KEAAU, Hawaii » Big Island marijuana suspect David Finley waived a preliminary hearing yesterday in which the prosecution would have been required to outline the evidence against him. Finley, 64, of Volcano, was arrested Monday when police raided an alleged marijuana growing and sales operation on his 29-acre ranch. Among the evidence found was 75 pounds of dried marijuana, police said. With the preliminary hearing canceled, District Judge Barbara Takase ordered the case sent to Circuit Court, where an arraignment will take place Feb. 15 before Judge Glen Hara. Takase ordered Finley to continue to be held in lieu of $1 million bail. A sewage pipe belonging to a condominium in Pauoa spilled about 3,150 gallons of untreated sewage into the Pauoa Stream on Thursday after metal hangers supporting the pipe corroded, causing it to buckle. Crews from the city Environmental Services Department fixed a section of the pipe within 3 1/2 hours, replacing a 13-foot section of cast iron with PVC pipe and stainless-steel hangers by 9:30 p.m. The pipe was hanging from a bridge near 124 Olomana Lane. Pauoa Stream empties into Honolulu Harbor by way of the channel along River Street in Chinatown. Crews posted warning signs along the stream yesterday and took water samples that would return bacterial contamination results in about 24 hours, a spokesman said. Police arrested a juvenile yesterday for allegedly sexually assaulting another juvenile in Moanalua. They said the victim reported being sexually assaulted by an acquaintance on Ala Kapuna Street between 3 and 4 p.m. Monday. After being identified by the victim, the suspect was arrested yesterday for investigation of two counts of first-degree sexual assault and three counts of third-degree sexual assault, police said. Police would not divulge the age of the juveniles. A 32-year-old man who allegedly used another man's credit card to buy goods in December was arrested when he tried to use the same card again on Thursday, police said. The first purchase was made Dec. 23. The man returned to the same store on Thursday to make another purchase but was arrested for investigation of identity theft and fraudulent use of a credit card, police said. Police arrested a 26-year-old homeless man Thursday for allegedly attacking another homeless man with a brick. The suspect was sleeping on a bench at Ala Wai District Park at about 5:30 a.m. Thursday when a 55-year-old man sat next to him, police said. He told the older man to leave, but he refused, police said. The suspect then allegedly struck the victim with a brick, causing minor injuries. Police arrested a 37-year-old woman who allegedly used someone else's driver's license while buying goods at the Keeaumoku Wal-Mart. The woman presented the license while making a purchase at about 3 a.m. Thursday, police said. An employee got suspicious and called the police, who arrested the woman for investigation of unauthorized possession of confidential personal information. A 26-year-old man was allegedly found with drugs while breaking into a vehicle. The suspect was reported searching through a vehicle in a Waikiki public parking lot at about 6:30 a.m. Thursday. Witnesses said they knew the car belonged to a co-worker, and called police. The man was later found to have a bag of a clear crystal substance, police said. He was arrested for investigation of unauthorized entry of a motor vehicle and promoting dangerous drugs. Police arrested a 31-year-old man who allegedly tried to use a counterfeit bill to buy gas. At about 5:30 p.m. Thursday, the suspect tried to purchase gasoline at a Pearl City station using a counterfeit $20 bill, police said. He was arrested on suspicion of first-degree forgery. WAILUKU » Fire caused $40,000 in damage to the structure and contents of a house in a remote area of south Maui. The fire destroyed the home at 1 Kanaio Road before firefighters could get to the blaze, Battalion Chief David Kamalani said. Kamalani said firefighters, who at one point traveled by four-wheel drive for a mile, took more than an hour to get to the scene after the initial call at 12:29 p.m. Thursday. The Hawaii County Police Department promoted three lieutenants to captain, effective Thursday. Duane Rapoza now heads the Training Section in the Administrative Services Division. He fills a vacancy left when Jay Enanoria was promoted last month to major from captain. Rapoza formerly worked in the Communications-Dispatch Section. James O'Connor commands the Kau District, filling a vacancy left when Capt. Marshall Kanehailua transferred to the Internal Affairs and Intelligence Unit. He had headed the Police Department's Special Response Team. James Sanborn commands the North Kohala District, filling a position vacant for several months. Sanborn was in charge of Community Policing.